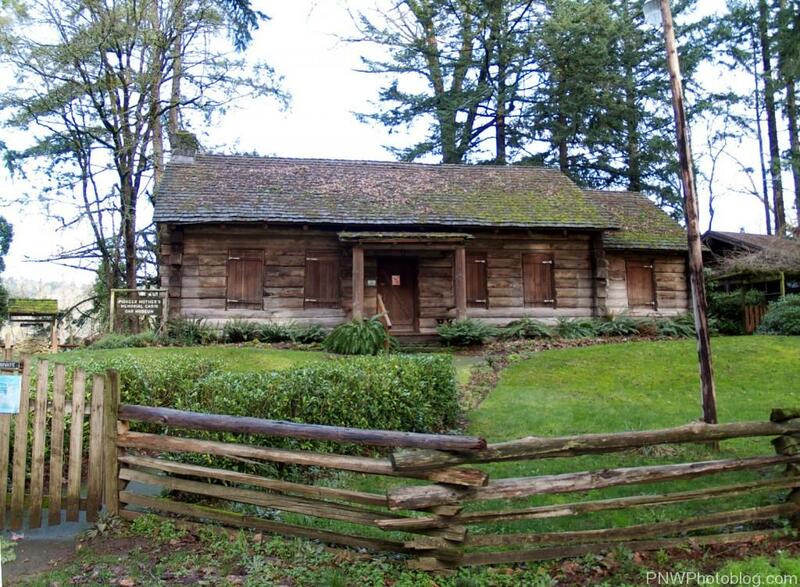 Champoeg (pronounced sham-POO-ee) is the birthplace of Oregon, and it can be argued the Western United States. It was here that the first delgetations settled on the question of Oregon’s position as part of the United States, or as part of Britain’s holdings of Canada. This area, known as French Prairie, was explored personally by Doctor John McLoughlin, Chief Factor of the Hudson Bay Company at Fort Vancouver, who found it’s fertile plains to be a very agreeable area to settle. An camp was built here called Encampment du Sable with the purpose of supplying Fort Vancouver with grain. The Hudson Bay Company had a policy to return it’s employees to the city of their enlistment. But since many of the men met wives among the native populations or had no place to go back to anyways, this became a good location for those employees to settle when their enlistments ended. The Company gave settlers tools, seeds, etc to get them setup as homesteaders on French Prairie. Several communities made up of these ex-employees and native wives sprung up on this plain. “Settlement at Champoeg, “settlement at Gervais” and “settlement at McKay”. All three grew together and the entire prairie generally became known as Champoeg. Another town called Oxford was platted by Doc Newell in 1847. It was only a quarter of a mile away from Champoeg and was eventually absorbed by it. Further settlers from the Oregon Trail settled here, many of them pioneers predating the Wagon Trains. The earliest form of government in the area was a series of meetings held in the early 1840s. Meant to address attacks on livestock by wolves, a rudimentary system of government, including civil codes arose. On May 2, 1843 settlers here convened to vote on creating a rudimentary government. The answer to that question was “Yes,” but arguments arose about which country the settlers should petition. As many of the settlers were ex-employees of the British Hudson Bay Company, and Dr. McLoughlin had been extremely generous in support of the fledgling community, many thought they should be part of Canada. Another equally large group thought they should join the United States. A vote was taken by drawing a line in the ground. Eventually the vote was 52-50 in favor of joining the United States. William Gilpin, who had traveled west with explorer Captain John Fremont was given the task to take a petition to Congress in Washington D.C. He arrived in 1845, and the Oregon Treaty was drawn up in 1846 creating the Oregon Territory in 1848 and establishing a provincial government. Champoeg missed becoming the capital though. 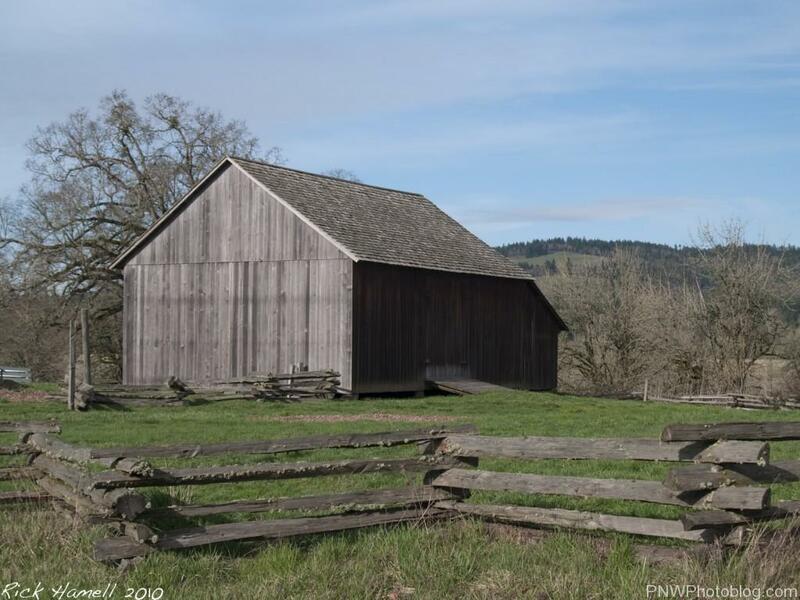 By 1852 as one of the oldest settlements in the Oregon Territory, Champoeg was a major transportation hub. With river traffic coming from dozens of small towns and ferry landings along the Willamette River, a newly established ferry and four major wagon roads (Champoeg-St. Paul Road, Champoeg-Salem Road, Champoeg-Oregon City Road, and the Champoeg-DeGuire’s Ferry Road,) it was ideally situated to stay that way and become a major city. Unfortunately like many other towns directly along the Willamette River, the December 2, 1861 flood wiped out most of the town. Only a few structures of the Newell Farm were known to survive the flood due to their location on the hill overlooking the town. Another building from this era also exists, Donald Manson salvaged a barn from the flood and rebuilt it at the top of the hill. This barn is now part of the living history museum. After the flood, Doctor Newell renewed his attempt to create a town called Newellsville that encompassed the old town site of Champoeg, his original town attempt of nearby Oxbow, and 80 acres on top of that. Unfortunately for him, the town was replatted yet again on November 4, 1886 and renamed back to Champoeg. By this time inhabitants had moved on and Champoeg was dead as town. Twenty years later Champoeg was an unremarkable piece of farmland that happened to play a place in Oregon history. When the Oregon Historical Society was founded in 1898, Champoeg was on the list of sites to be memorialized. An monument was erected and dedicated in 1901 on a small hill overlooking the old townsite. Annual celebrations were held nearby, and gradually over the decades a small memorial park grew into the park we know it today – Champoeg State Heritage Area, an official Oregon State Park. The original town center was about the location of this cabin next to the parking lot. A wharf into the river existed almost directly north of here. At it’s height about 150 houses spread over the north end of French Prairie along the river were considered part of the town. One of my ancestors was at that delegation.